Have you damaged a single tooth and want a replacement option that looks as natural as possible? Fortunately, the dentists at East Bentleigh Dental Group can provide single tooth replacement using a single dental implant. We boast over 30 years of experience and utilise state-of-the-art equipment, allowing us to deliver innovative treatments for patients of all ages. Whether you want to improve your smile and self-esteem or you want to minimise damage to neighbouring teeth, we can provide assistance. As part of our single dental implant services, we proudly utilise an extensive process to ensure optimal results. We first conduct a comprehensive consultation to assess your jawbone as well as the surrounding nerves and sinuses. This allows us to determine an appropriate course of action, reduce surgical risks, and avoid causing any problems. The first surgery then places the dental implant into your jawbone. Additional surgeries and appointments will be conducted over the next few months to ensure the implant has fused with the bones, the gums have healed correctly, and the crown has been fixed. It’s important to keep brushing and flossing several times a day throughout this process. 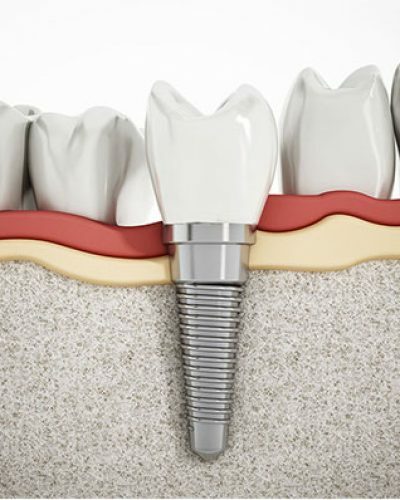 A single tooth implant offers various advantages over other tooth replacement treatment options. First and foremost, they’re aesthetically and functionally superior by looking and working just like normal teeth. Secondly, they replace the root and better preserve the bone, whereas other treatments like bridges can cause the bone to deteriorate. Furthermore, some alternative single tooth replacement treatments require the adjacent teeth to be grounded down to accommodate them. This can damage healthy neighbouring teeth unnecessarily and potentially cause avoidable complications in the future. A single dental implant, on the other hand, replaces the root and integrates with your jawbone more naturally. Additionally, dental implants are easier to clean and do not leave visible defects. This helps you maintain an attractive smile which can improve your self-esteem and confidence. There is also far less risk of bacteria causing decay. These are just a few of the benefits that a dental implant can deliver for people who require single tooth replacement. No dental procedure is completely risk-free, which is why patients should be aware of the complications that can arise. A single tooth implant can fail when infections develop (although these are rare) or when the way the teeth come together has not been properly adjusted to accommodate your bite. Clenching and grinding can also occur, placing pressure on the implant that can lead to bone loss and implant breakage over time. When a single dental implant has been used to replace one of the lower teeth, nerves that run through the jawbone can also be affected. Drilling of the bone and placement of the implant can cause damage that leads to numbness and tingling. However, these situations are uncommon when X-rays are used to identify the location of nerves. Even if your nerve sustains damage, there is a good chance that it will heal over time and that the symptoms will be temporary. Contact the friendly team at East Bentleigh Dental Group today to learn more about getting a single dental implant for single tooth replacement. Enquire now for more information and further assistance. Give us a call on (03) 9575 1100 or message us online and we’ll get back to you as soon as possible.